Eurotech and Actuate are both active members of the Eclipse Foundation, committed to advancing the Internet of Things and open source solutions. 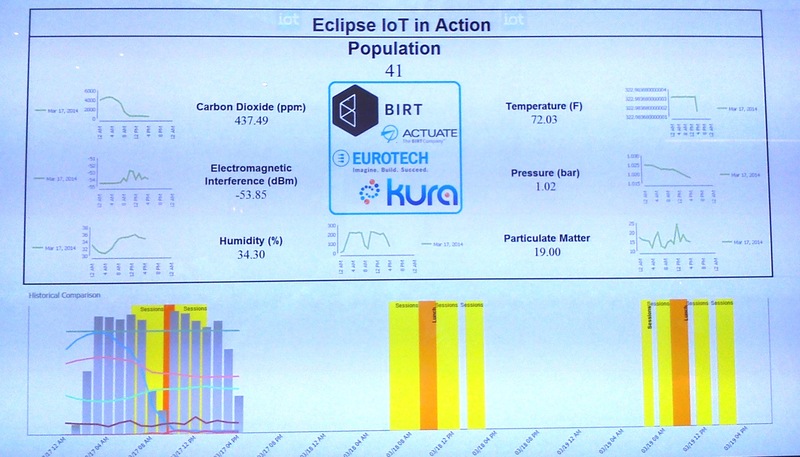 Eurotech is a founding member of the IoT Working Group within the Eclipse Foundation, and has contributed the Kura open source project to offer a Java/OSGI-based container for IoT applications running in M2M gateways. The advantage of open source working is the accessibility it provides to developers and engineers looking to build and launch IoT solutions. The collaborative nature of this open source project means the time to develop and implement future projects can be greatly reduced simply by sharing knowledge amongst the IoT community. This project demonstrated the value to be gained from this way of working and the power of collaboration. People counters were mounted at the entrances to the Grand Hall of the EclipseCON 2014 event as well as the main keynote theatre. These counters identify the head and shoulders silhouette of people passing beneath them whilst simultaneously capturing the direction of movement into or out of the area. There is no facial recognition or personal detail collected so this is an anonymous system which doesn’t compromise confidentiality or privacy restrictions but still allows valuable data collection. The initial difficulty to be overcome was how to mount the monitors. The venue were understandably less than happy with the idea of holes being drilled in their doorways so this had to be accommodated whilst still getting the project off the ground in a timely manner. In the end, tension rods were installed above the doorways in order to mount the monitors safely without causing damage, demonstrating just how easily sensors and devices can be incorporated into existing frameworks. Environmental monitors were then established at strategic points around the internal space to measure carbon dioxide emissions, humidity changes, electromagnetic outputs and even particulates and pollutants invisible to the eye but present none the less in the air we breathe. The data collected was configured through smart gateways and collated in the Everyware Cloud where it could be pushed to a simple, custom built dashboard for real time monitoring. The IoT gateway stack included a Raspberry Pi with additional hardware and a Linux layer, Eclipse Kura providing a Java and OSGI based framework for IoT and M2M applications, in this case, the Eclipse Equinox OSGi framework. MQTT was used to transport the data to the cloud, which was also responsible for the ongoing calibration required by the environmental monitors. The data aggregated in the cloud, as demonstrated in previous EclipseCON events, could also go to Actuate’s BIRT (Business Intelligence & Reporting Tools project) iHub which then consolidates historical data to create web reports, dashboards and PC and mobile interfaces to allow users to quickly and easily access the data and begin gaining insights. Not only did this system provide a live stream of data available for real time action but also the ability to track readings throughout the day, and across longer historical records, to assess how changing population numbers directly affects the air quality and environment. With this information so easily available it should simply be a matter of time until we are able to truly take accountability for the impact we have on our environment.